Mushu loves bacon. Ron always cooks her some of her own when he makes bacon for breakfast. The other day I brought home a breakfast sandwich with bacon on it when I came home from working out and she smelled the bacon the second I walked in the door. 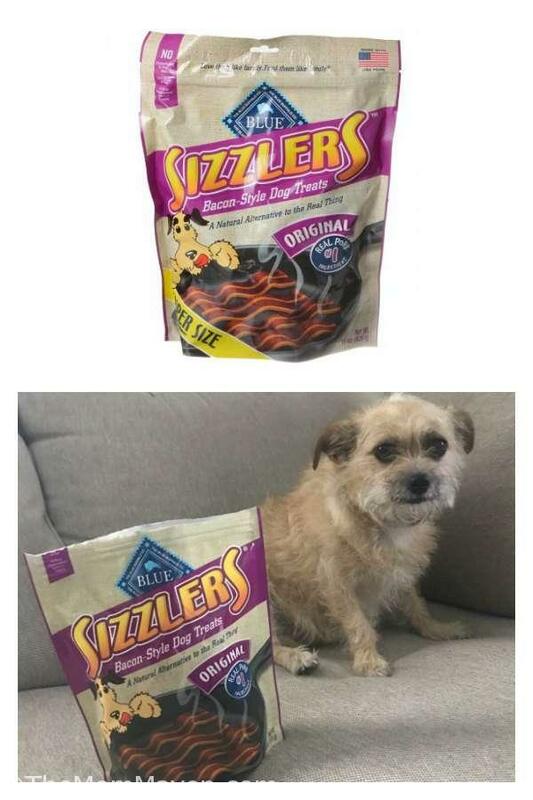 Recently I had seen a commercial for Blue Buffalo Sizzlers and thought, “I need to get those for Mushu.” Then a few days later I had the opportunity to have Mushu review them through our partnership with Chewy.com! Such a blessing. These dog treats get Mushu’s tail a-wagging, I’m sure your pup will love them too. Blue Buffalo Sizzlers are bacon-style dog treats made with real pork as the first ingredient. Here are all the ingredients: Deboned Pork, Pearled Barley, Rye, Pea Protein, Potato Protein, Tapioca Starch, Vegetable Glycerin, Cane Molasses, Brown Rice, Brown Sugar, Oatmeal, Gelatin, Canola Oil, Dried Cultured Skim Milk, Cheese Powder, Bacon Fat, Natural Flavor, Salt, Sunflower Lecithin, Paprika, Potassium Chloride, Carrot, preserved with Citric Acid & Mixed Tocopherols, Oil of Rosemary. These great-tasting, natural dog treats contain no red, blue or yellow dyes, no BHA preservative, and no corn, wheat or soy like some other bacon-style treats. These are not grain-free, which makes me a little sad because we have Mushu on a mostly grain-free diet due to allergies. Ron has been giving her 1/2 a Sizzler each night and we are watching to see if they cause her allergies to flare up, so far so good. Mushu loves these treats and walks right over to the package when she comes in from her last potty trip of the evening. If you are looking for a bacon type treat for your dog, I’d suggest you check out the Blue Buffalo Sizzlers from Chewy.com.